Kamalakar Rao is the son of the great philanthropist and music lover Sri G.Varada Rao and Smt Netravathi of Rajahmundry. He was born on the 8th of June in the year 1936. The musician in little Kamalakar showed up at a very young age when he used to play the mridangam at the age of 5. Noticing his interest, his father enlisted him under the initial guidance of Sri. Raju garu. 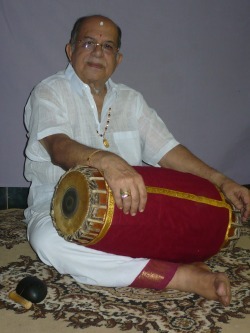 Sri Raju garu used to play the mridangam for the bhajan congregations that were held at Kamalakar’s house. Later Kamalakar came under the tutelage of late Sri. Varanasi Yagnanarayana Sastry of Rajahmundry who hailed from a family of mridangam exponents. When Kamalakar was 10 years old, his father put him under late Sri.Yella Somanna of Pallakollu, who used to come to Rajahmundry for concerts. In 1949 Sri Somanna joined AIR Vijayawada and from then on Kamalakar used to travel to Vijayawada for mridangam lessons every week. Noticing the sharpness of Kamalakar, Sri.Somanna advised Sri Varada Rao to take him to Palakkad and put him under the tutelage of the universally acknowledged mridangam wizard Padmasri Shri Palghat.T.S.Mani Iyer. From the age of 13 Kamalakar was Mani Iyer’s student in Palghat and in Thanjavur in the Gurukulavasa Paddhati. Sri Mani Iyer treated Kamalakar as his own son and moulded him into a well accomplished artist. Kamalakar Rao is a graduate from the Andhra University. During his college days, he was awarded the President of India medal at an inter-university competition; he received this award from the hands of the then President Sri Sarvepalli Radhakrishnan. At the very young age of 8, he started providing accompaniment in concerts. At the age of 12, he accompanied Violin Everest Sri.Dwaram Venkataswamy Naidu’s at the latter’s violin solo concert and won the appreciations from the maestro himself and also from the audience. His highly intricate rhythmic patterns and sense of proportion have been a major factor in the enhancement of concerts. His keen sense of anticipation established remarkable rapport with the main artists. He accompanied and won appreciation from the masters of yesteryears like Alathur Srinivasa Iyer, G.N.Balasubramanyam, Semmangudi Srinivasa Iyer, Chembai Vaidhayanadha Bhagavathar, T.K.Rangachari, Mahavadi.Venkatappaya Sastry, Sripadha Pinakapani, Eathara Nagarau and Emani Sankara Sastry. He has also accompanied the masters of today like Mangalampalli Balamurali Krishna, Nedunuri Krishna Murthy, Nookalachinna Satyanarayana, M.S.Balasubramanya Sharma, T.N.Seshagopalan, T.V.Sankaranarayanan, Lalgudi G.Jayaraman, Mandolin U.Srinivas, N.Ravikiran, Chittibabu, L.Subramanayam, Annavarapu Rama Swamy, T.R.Subramanayam and Dwaram Durgaprasadrao. Kamalakar Rao has played in almost all the prestigious music sabhas in all over India. He has toured all over the world with Nedunuri Krishna Murthy, Chittibabu, Lalgudi G.Jayaraman, Mandolin U.Srinivas, N.Ravikiran, Chittibabu, L.Subramanayam, T.R.Subramanayam, Trivandrum R.Venkatraman, Lalgudi G.J.R.Krishnan, etc. He took part in the Hong Kong Festival during the 1970s along with Chitti Babu. He performed in the Adelaide festival during the 1980s with L. Subramaniam. During the year 1997, he performed in Greece and Syria along with violin maestro Lalgudi Jayaraman in the “50th year of India’s Independence” festival. He has also released many discs in the USA, Australia, France and back home at India. He is a TOPCLASS artist of AIR and has participated in the Akasavani Sangeetha Sammelans and National Programs arranged by AIR and Doordarshan. He was felicitated with the kanakabishekam and honoured with the title of Mridanga Vidwanmani by Sri Thyagaraja Narayadasa Seva Samithi of Rajahmundry, the Mridanga Ratnakara by Sri Ramabhaktha Ganasabha of Rajahmundry, Mridanga Kalavathamsa by Thyagaraja Ganasabha of Ananthapur, Mridanga Kovida by Kannada Seva Sangam of Vijayawada, Mridanga Sudhakara by Kannada Seva Sangam of Rajahmundry, Mridanga Kadal by Karaikudi Sangheetha Sabha of Karaikudi, Nada Bageeratha by Parupalli Sangheetha Samakhya of Vijayawada, Mridanga Kala Praveena by Sangheetha Kala Samithi of Vizag, Mardhangika Sarvabouma by Thygaraja Ganasabha of Thadepalligudem, Mridanga Sudhanidhi by Ragasudha of Rajahmundry, Sangheetha Kala Sagara by Visaka music academy of Vizag, Sangeetha Vidyanidhi by the Andhra Music Academy, Hyderabad. He is the recipient of the Ganapati Sachitananda Award by Srutilaya Sevakendra Natarajalaya of Karaikudi R.Mani, the Palghat mani iyer Memorial Award with the title of Mridanga Kala Siromani and the prestigious Central Sangeet Natak Academy Award in the year 1999. He was felicitated by KANCHI KAMAKOTI PEETHAM at Chennai on June 4th 2010. He is also ASTHANA VIDWAN of GURU SRI RAGHAVAVENDRA SWAMY MUTT, MANTHRALAYAM Since 2010. He has also participated in many Jugalbandhi concerts notably with L.Subramayanam and Yehudi Menuhin at the United Nations Hall at New York. Other extremely successful jugalbandhis include those with V.G.Jog and L.Subramanyam, with V.G.Jog and M.S.Gopalakrishnan and with Ustad Ali Akbar Khan and L.Subramanyam.